The school is affiliated by Central Board of Secondary Education. All students at OAK can pursue their learning in an uninhibited and non-restrictive manner. The school aims to provide holistic development to its students and is opposed to a rigid and stressful examination policy. Keeping this in mind, the school follows the CBSE pattern of the evalution. The all round development of a student is assessed through a variety of interesting activities, rather than just a written examination. We follow the teaching method and the evaluation pattern designed by the Central Board of Secondary Educaton. To lay emphasis on thought process and de-emphasise memorization . To use evaluation for improvement of student’s achievement and teaching – learning strategies on the basis of regular diagnosis followed by remedial instructions. To use evaluation as a quality control device to maintain desired standard of performance. To determine social ability, desirability and effectiveness of a programme and take appropriate decisions about the learner and the process of learning environment. To make the process of teaching and learning a learner – centred activity. A child’s first experience of school is the most important experiences in life setting an approach to learning that can become a lifetime’s habit. Children need to feel safe and have classrooms that combine wonder and energy and foster a tone that allows even the most quiet and sensitive child an equal opportunity to interact with teachers, assistants and fellow students. The early childhood years focus on learning through experience, interaction and inquiry. 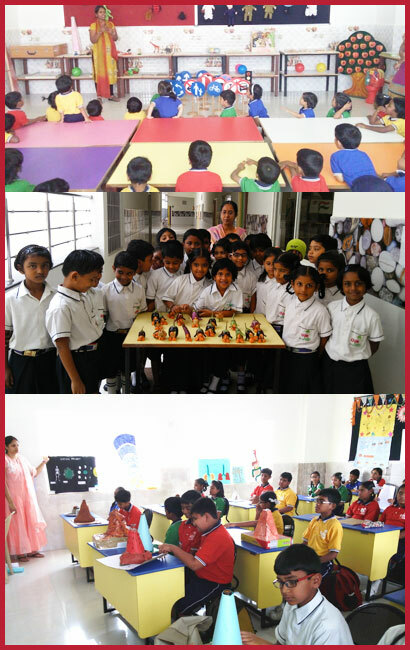 Classrooms are vibrant and colourful centres of happy activity. Even our youngest students are proud of their environment and eager to express their joy in learning. The early years at OVIS is a family within a family. It caters to the specific needs of young learners in a safe and nurturing family environment within the large canvas of the school community. The programme focuses on building foundation of learning by equipping students with key skills in literacy and numeracy enabling them for future learning. Children are encouraged to think independently and work collaboratively. They are also placed on building self-esteem and confidence during these tender years , by helping students understand themselves better as learners as well as members of a community. 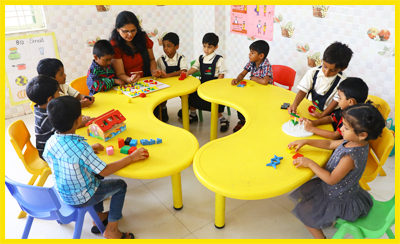 The early years programme prepares children by extending their learning through group activities and hands on work through our enquiry based approach. These crucial years are used to help children to improve their self confidence and build their curiosity. Teachers engage with students to make learning their own. The Oak Primary School program for grades I to V aims to provide our students, who are confident in their academic success and are developing socially, physically and psychologically with a happy and engaging learning environment that is structured, collaborative and purposeful. We also encourage appositive and involved community of students and facilities. The curriculum is divided into scholastic areas and non-scholastic areas which include English, Second and Third languages, Maths, Science and Social studies. At Oak we utilize a variety of teaching aids and methods in the classroom – experiments, word games, puzzles, role-play, audio visual room equipment, group projects, individual projects and field trips help students enhance their understanding. Students are posed with questions that help them relate concepts to their day to day experiences. Oak educators update themselves through training session and workshops to maintain our high standards of instructions. The Oak middle school program for Grades VI to VIII offers a wide range of subjects and encourages high academic standards through a practical approach to teaching and learning. Assessment is not limited to conventional written papers but they include a variety of texts like oral and listening text. The scholastic areas in the middle school curriculum delve into deeper content knowledge in the areas of Mathematics, General Science, Social Studies, Languages and ICT education. Students engage in hands on learning experiences in our Science, Mathematics and Social Studies laboratories. Oak curriculum prepares students not only for the challenges of secondary school and competitive exams but for the world that avails our students beyond school. Our middle school program also includes our immersive co-curricular program. Students are also encouraged to take part in external examinations like the Olympiads and special events like elocution, debate, quizzes and essay writing are conducted throughout the year to help students enhance their skill of expression. The Oak Secondary school program for grades IX and X offers CBSE curriculum. Students are enriched with content knowledge, application, understanding and analytical activities. They are trained in life skills, social skills, creative thinking and effective communication with positive aptitude and attitude for excellent performance in proficiency and entrance tests as well as facing the global challenges and world of work. Students have an extra ordinary ability to learn provided they are given the right resources. 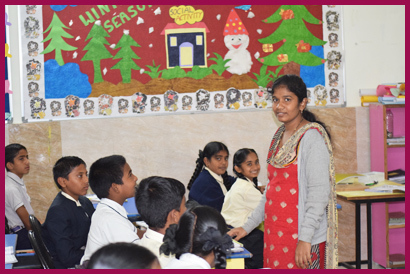 Our students participate in immersive co-curricular programs to continue their all-round growth and development. An interactive digital learning facility is networked to every classroom. This method of learning captures a student’s attention and also simplifies complex problems, allowing them to visualise and understand concepts very quickly. Our well equipped laboratories, library resources, learner–centric environment and dedicated faculty ensure and enrich learning experience for our secondary school students.